An Infectious Diseases Physician and Microbiologist, Dr Paul Griffin was appointed as the Director of Infectious Diseases at Mater Health Services in 2013. 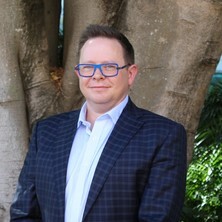 In addition Dr Griffin continues appointments as Principal Investigator at Q-Pharm, as Visiting Scientist/Honorary Research Fellow at Mater Medical Research Institute and Queensland Institute of Medical Research, and also as Senior Lecturer at the University of Queensland. Dr Paul Griffin's primary research interests include clinical trials in the field of infectious diseases particularly malaria human challenge and transmission blocking studies, as well as the detection of antibiotic resistance particularly VRE by mass spectrometry in the clinical microbiology laboratory. Griffin, Paul (2014). Australian Bat Lyssavirus. In Victor L. Yu, Rainer Weber and Didier Raoult (Ed. ), Infectious Disease and Antimicrobial Agents (pp. 1-1) Pittsburgh, PA, USA: Antimicrobe. Griffin, Paul (2014). Barmah Forest Virus. In Victor L. Yu, Rainer Weber and Didier Raoult (Ed. ), Infectious Disease and Antimicrobial Agents (pp. 1-1) Pittsburgh, PA, USA: Antimicrobe. Griffin, P. M. (2014). Menangle. In Infectious Disease and Antimicrobial Agents (pp. 1-1) Pittsburgh, PA, United States: Antimicrobe. Griffin, Paul (2014). Ross River Virus. In Infectious Disease and Antimicrobial Agents (pp. 1-1) Pittsburgh, PA, United States: Antimicrobe. Griffin, Paul and McCarthy, James (2010) Malaria: Part 2. Medical Observer, 23-23. Griffin, Paul and McCarthy, James (2010) Malaria: Part 1. Medical Observer, 23-23. Yamada, M., Miller, D., Lowe, M., Rowe, C., Wood, D., Byrnes-Blake, K., Parrish-Novak, J., Ishak, L., Olson, J., Brandt, G., Griffin, P., Spleman, L. and Prow, T. (2018). A fitst-in-human study of BLZ-100 (tozuleristide) demonstrates tolerability and fluorescence contrast in skin cancer. In: International Investigative Dermatology (IID) Meeting, Orlando FL United States, (S70-S70). 16-19 May 2018.